The New Year in Nepal starts on Baishakh. Baishak is the first month of Bikram Sambat Calendar. Bikram Sambat is the official calendar of Nepal. Nepal celebrates nine different new years in different times of year. Baishak 1st falls in mid April. Please refer our page Nepali Calendar to read more about Bikram Sambat calendar. This year Baishak 1st coincides with 14th of April of English calendar. Nepal has more than 60 ethnic groups with their own unique culture and most of them have their own language. In other words Nepal is a live example of unity in diversity. People of different cast and culture live in Nepal. We all have our own New Year and we celebrate 9 different new years. We celebrate each of them with same zeal and enthusiasm. However, Baishakh 1st is regarded as national New Year, the country’s official calendar year starts this day. People plan picnic, tour and travel in this day. New Year is a fun day celebration. Friends and family gathers and organize picnic or day out. Parks across the country are full of people with celebration. People make new resolution this day. Students plan their study schedule for the year. People exchange gifts and greeting cards. 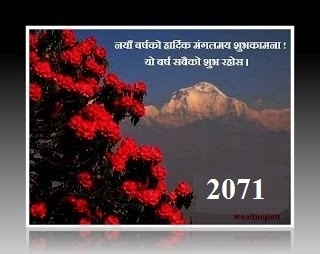 New year day is a public holiday in Nepal.